It is a well-known fact that Miskolctapolca is a real rarity among the range of thermal spas. Its Cave Bath is unique in Europe, for such high temperature degree cannot be found in karst anywhere else. In the past couple of years it was renewed several times, also in the recent period it has become more attractive through reconstruction. 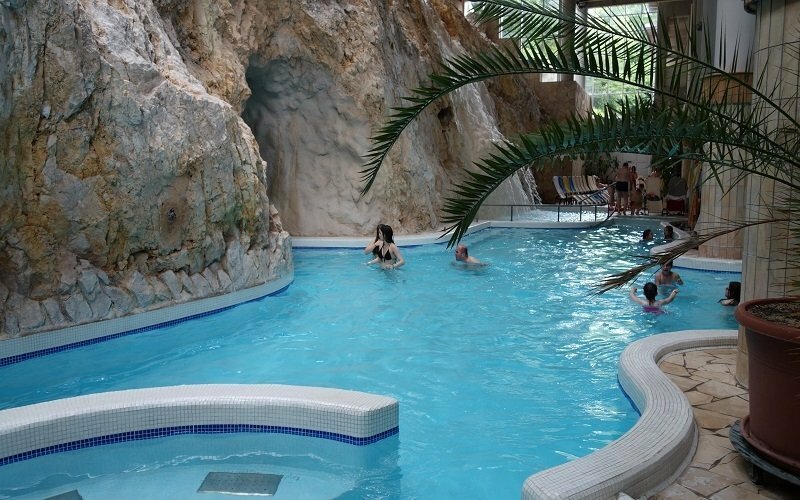 The Cave Bath is located in a beautiful environment also rich in tourist sights, to be found in North-Eastern Hungary, in the holiday resort of Miskolc city, in Miskolctapolca. Miskolc is a settlement established during the Hungarian conquest, which is now a large city with 192,000 inhabitants, with identical historic monuments, infrastructure, cultural traditions and events, a training and scientific background (University of Miskolc). The holiday resort Miskolc-Tapolca is located in the direct vicinity of the large city (7 km from the city centre), offering a special micro-climate, its park of local importance, subject to preservation, a Boat Lake, and the Cave Bath built upon the excavations of natural cavities caved by medicinal thermal water. Miskolc-Tapolca can be reached from the city by car, local bus service and also via a bicycle route now constructed. It should be noted that this route along the Hejő creek can also be walked, run or jogged. The real value of the place is represented by the three elements mentioned above, called the “Valley of Waters” under the tourism development strategy already drafted. Under the long-term development concept, a new area is also attached, the abandoned quarry located on the west side of the Castle hill including the Cave Bath, which is called the “Valley of Rocks”. One of the real treasures of the region is the Lake Cave transformed into a Cave Bath, caved by water throughout thousands of years out of the hard limestone rocks. 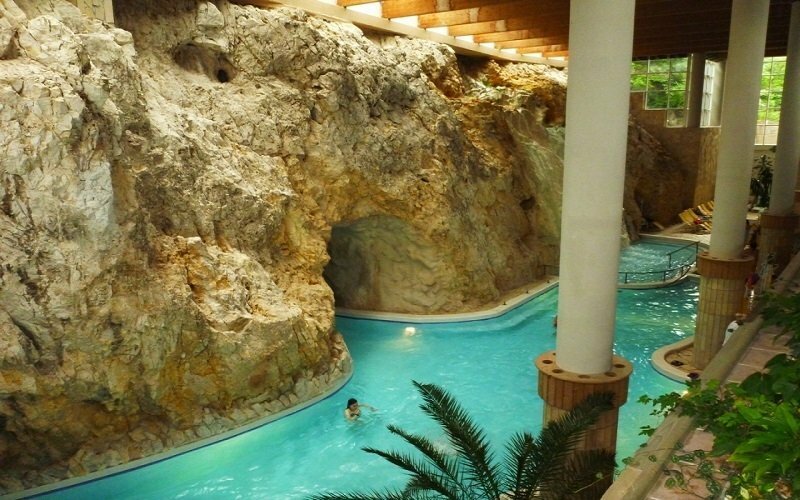 At the Cave Bath of Miskolctapolca, a facility unique in Europe, it is an unmatched experience to swim and bathe in the indoor pool of nature, in the thermal water of pleasant temperature springing from the depths of the mountain, and to enjoy the clear air free of any contaminants. There are many who also believe in its healing effect, which is primarily due to the pleasant, curative climate of the cave, and its warm karst water. This thermal water is not so much concentrated as other medicinal waters (the total salt content of the thermal water used in the spa complex is less then 1,000 mg/l), this is why it is popular among many visitors. Namely, in this water - in contrast to certain much more concentrated medicinal waters - one may bathe and swim for an unrestricted period of time, and try the excellent massage shower and other aquatic attractions. These will now be further extended and improved: there are newly established drift sections, recently revealed natural tunnels and halls connected to the cave pool known by many. The “Globe Hall” awaits those in favour of funny surprises, and there is also a huge Jacuzzi next to it to massage visitors by underwater jets. A bit further ahead, we can reach the bathing pool of the most beautiful cave section excavated the longest time ago against (or just with the help of) the water flow of an “underground river” operated by a hidden device. 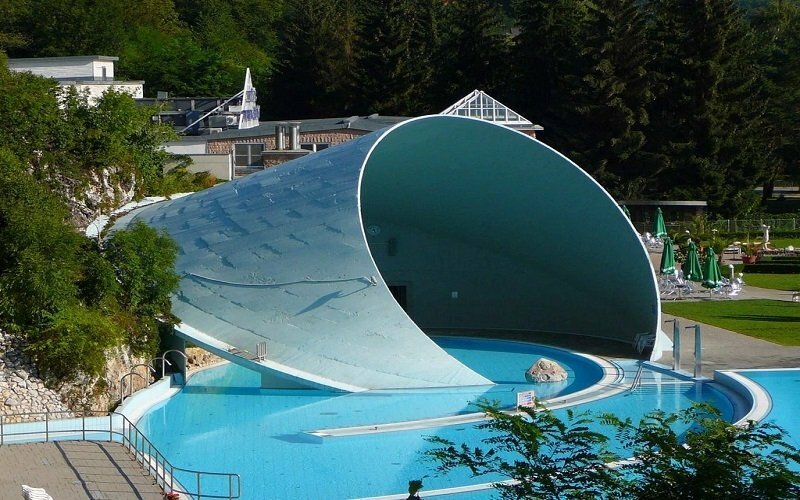 However, at the Cave Bath we do not need to give up the idea of swimming outdoors or to see the park of Tapolca: while the cave is a masterpiece of nature, the lake pools and the light and elegant shell roof arched above the pool represents the praise of human creativity. There is no winter and summer season at the cave Bath. In the cave tunnels there is eternal spring, whether it is boiling hot or bitterly cold outside.